Envisio gives innovative city executives a feature-rich, easy-to-use alternative to confusing spreadsheets and static documents, while allowing them to operationalize their plans and hold staff accountable for outcomes, says Mike Bell, CEO of Envisio. Envisio Solutions Inc., a cloud-based strategic plan implementation, performance management, and reporting software, announced today the addition of two government customers who are using Envisio to drive cross-departmental collaboration, improve reporting to Council, and promote community engagement. 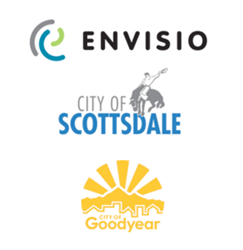 The City of Scottsdale and the City of Goodyear have implemented Envisio across their respective organizations to assist them with their strategic plan implementation and reporting process. From a single dashboard, Envisio will deliver a user-friendly, visually-appealing, and interactive experience that gives city managers full visibility into the progress of their municipality’s strategic and operational plans. In addition to full access to real time, rolled-up performance metrics and staff commentaries, these two cities can access detailed progress reports that can be shared instantly with Council and residents. "The cities of Scottsdale and Goodyear, Arizona join a growing number of innovative local governments that are embracing technology to create dynamic and engaged workforces. Through Envisio, they will be able to build the new accountability frameworks that today's residents demand. We are pleased to include these forward-thinking cities in our growing list of customers," says Mike Bell, CEO of Envisio. Envisio has easily adapted to Scottsdale and Goodyear’s unique planning needs and provides each city’s administrators with real time performance measurements and management dashboards that cascade down in execution and roll up during reporting. Engaging department directors and enabling visibility into the status of their government’s strategic plans empowers their senior leadership team with the information they need to make quality and timely decisions.